From the New York Times bestselling author of The Program comes a brand-new haunting, romantic, and suspenseful story about one girl’s search for healing in a grand and mysterious hotel full of secrets. Stay tonight. Stay forever. When Audrey Casella arrives for an unplanned stay at the grand Hotel Ruby, she’s grateful for the detour. Just months after their mother’s death, Audrey and her brother, Daniel, are on their way to live with their grandmother, dumped on the doorstep of a DNA-matched stranger because their father is drowning in his grief. Audrey and her family only plan to stay the night, but life in the Ruby can be intoxicating, extending their stay as it provides endless distractions—including handsome guest Elias Lange, who sends Audrey’s pulse racing. However, the hotel proves to be as strange as it is beautiful. Nightly fancy affairs in the ballroom are invitation only, and Audrey seems to be the one guest who doesn’t have an invite. Instead, she joins the hotel staff on the rooftop, catching whispers about the hotel’s dark past. The more Audrey learns about the new people she’s met, the more her curiosity grows. She’s torn in different directions—the pull of her past with its overwhelming loss, the promise of a future that holds little joy, and an in-between in a place that is so much more than it seems… And the 13th chapter will only add to the mystery behind the 13th floor of Hotel Ruby...and ultimately, what it means for Audrey. Welcome to the Ruby. Fans of BAD GIRLS DON'T DIE will definitely love HOTEL RUBY. Though HOTEL RUBY isn't a story about ghost-induced horror (well, sort-of not), they do share a similar tone and feel. So let's get cracking and down to business. The narrator, Audrey Casella is the first of her family to notice how strange the hotel is. First, there are the many talks of ghosts and the 75 people who died in the hotel. Second, there are mentions of the hotel as if the hotel is alive and conscious of itself. (Feeling creeped out yet? I swear the book started scaring me the second it mentioned ghosts.) Audrey doesn't know what's happening in the very beginning, but she knows something is incredibly wrong. And thus, starts the journey of finding out the truth. Let's talk about the love interest. Elias Lange gets some moments and dialogue in the book, but he should have gotten some good character development. Though the romance isn't a focus point of the story, I would love to see a little more of it. The villain of HOTEL RUBY is crafty, and readers can never be too sure of who exactly he/she is until the very end. He/she is someone we all love to hate and... well, bury six feet under. Again. 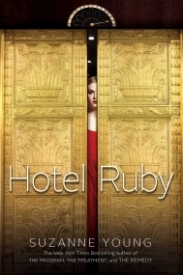 Overall, HOTEL RUBY is a story you do not read in the middle of the night (a decision I heavily regret after strange dreams about people chasing me through a three-star hotel). It's for fans of Katie Alender and those looking for a horror story with a twist.